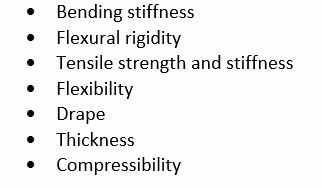 Softness and strength are generally seen as the two most important consumer attributes in tissue and towel grades. Softness should be maximized to improve consumer perception of the product, whereas strength should be at a level to provide adequate functioning of the product during use. Unfortunately, there is a well-known inverse relationship between softness and strength as illustrated in Figure 1. 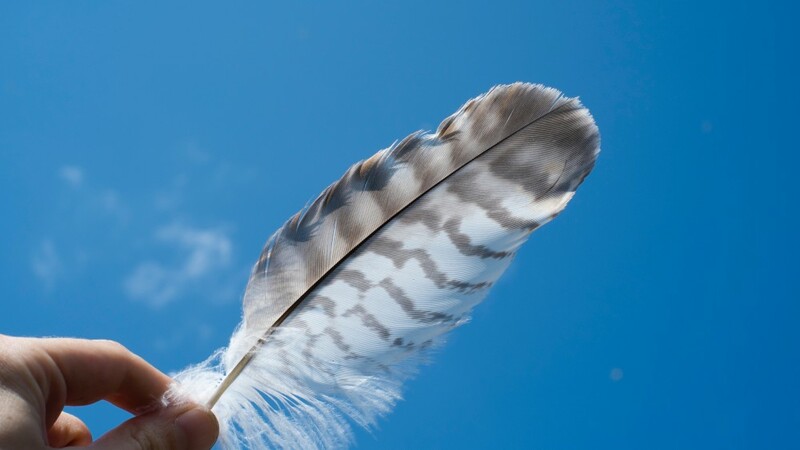 As softness increases, strength decreases, or put a different way as strength is increased, softness is reduced. 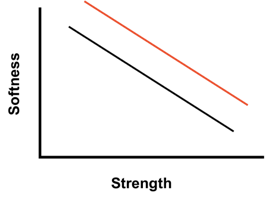 Therefore, a fundamental goal of tissue product development is to move beyond the existing strength/softness relationship for a given process (shown in the black line below), and to obtain improved softness with less of a penalty to strength, or even better, with no loss in strength (as indicated by the red line). Figure 1: Inverse Relationship of Softness vs. Strength. 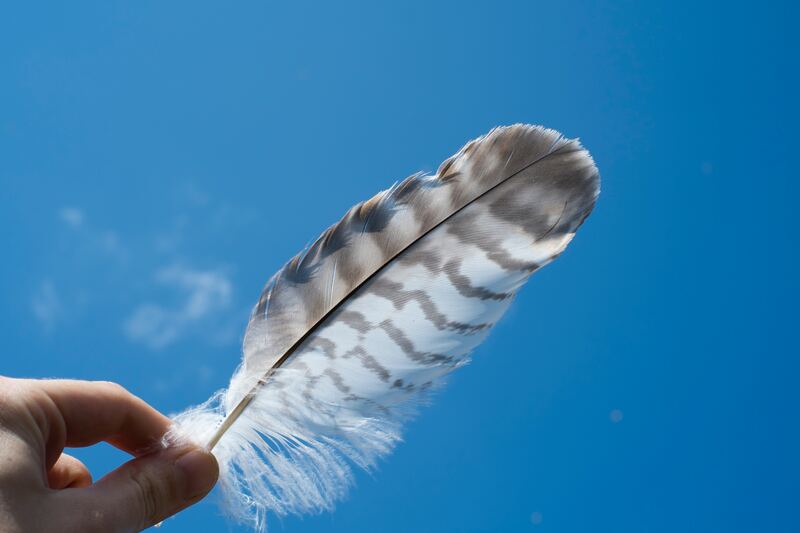 Although all of the above senses are involved in softness perception, the primary determinant is tactile. The human sense of touch begins with receptors in the skin which provide electric signals that are transmitted to the central nervous system and to the brain. Amazingly, there are about 17,000 mechanoreceptive units in the skin of a human hand. Importantly, tactile perception is dependent on movement of the hand over the item of interest, in this case a sheet of tissue paper. Softness of tissue paper is generally recognized as being comprised of two components – bulk softness and surface softness [2,3]. The perception of bulk softness is discerned by gentle crumpling or folding of the tissue, and is inversely related to flexural rigidity or bending stiffness. The perception of surface softness is judged by the light brushing of the fingertips over the tissue surface. It is related to the smoothness, texture and surface uniformity of the tissue and, therefore, is very sensitive to protruding fibers or irregularities at the surface. The compressibility of the surface also plays a role in surface softness. It is important for tissue manufacturers to have a means to assess, or rank, softness of their own and competitive products, since it is the primary determinant of consumer preference in grades like bath and facial tissue. The most accepted technique available to evaluate softness involves subjective panel tests, which consist of assigning an arbitrary softness rank value to a particular tissue sample of interest, usually in comparison to a set of standards [4, 5]. Panel testing can involve single or multiple comparisons between samples and to standards. Ranking values can be assigned to arbitrary scales, for example 1-10 or 1-100. In most cases, a set of pre-judged tissue softness standards are used for comparison. Alternatively, samples can be ranked against each other without using standards. The drawback to panel tests is that they can be unduly influenced by human factors and, furthermore, can be lengthy and costly to perform. A group of trained panelists must be maintained. In an effort to make softness testing easier, quicker and more objective, instrumental methods (as an alternative to panel testing) have been evaluated over the years and continue to be developed. Methods can be used to evaluate bulk and surface softness as separate components. These individual results can then be combined into a user developed algorithm to approximate a panel softness value. In addition, some instrumental methods incorporate both bulk and surface softness components into one measurement. A literature review of methods to measure tissue paper softness is provided in reference . The bulk component of softness can be quantified in a relatively straightforward manner by means of one or preferably a combination of various well-known methods for measuring stiffness, bending resistance and/or flexural rigidity. 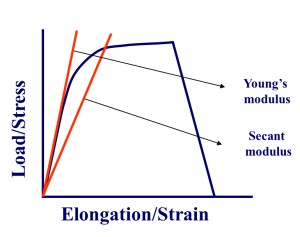 Tensile stiffness is illustrated below as the slope of the stress-strain curve. This slope is referred to as the modulus. 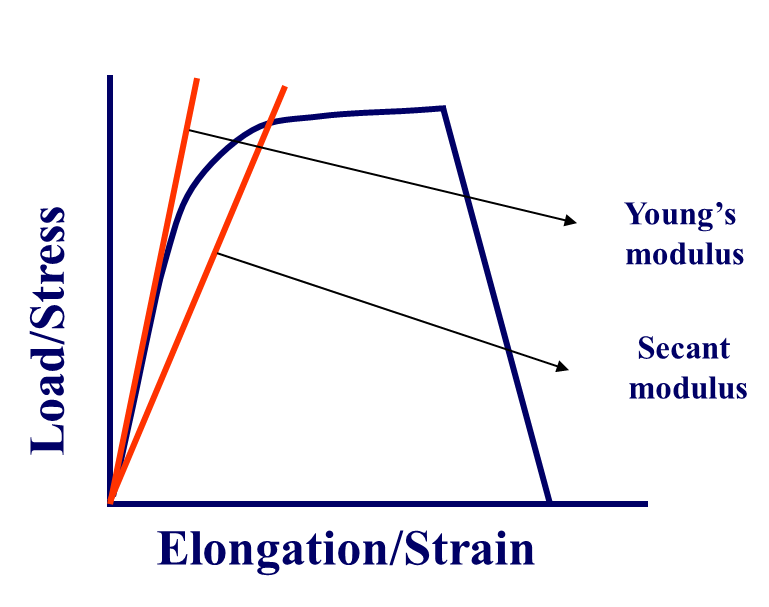 Young’s modulus refers to the initial slope of the stress-strain curve, whereas secant modulus is the slope of a line from the origin to any designated point on the stress-strain curve. Producers will define the end point based on their own assessment of what correlates best with consumer perceived bulk softness. Surface softness can be more difficult to quantify since, as already mentioned, many subjective physiological and sensory factors affect this perception . A useful means to describe the surface hand feel of tissue paper is by using two analogies to textile fabric types (see Figure 4). In the first case, increasing the number of free fiber ends protruding from the surface of the tissue can enhance the surface feel. This is commonly referred to as a flannel-type surface. In the second case, increasing the smoothness and/or lubricity of the surface can also enhance the hand feel. This is referred to as a silk-type surface. Profilometers, or stylus-type instruments are used to approximate the motion of a human fingertip across the tissue surface. An early example is the LENA apparatus described by Hollmark  and shown in Figure 5. Figure 5. Surface softness measurement using LENA profilometer. Surface friction can be measured using a coefficient of friction (COF) tester with a sled attachment. An example is given by Kuo and Cheng  as shown in Figure 6. Figure 6. COF method of measuring surface softness. Examples of instruments which combine measurements of surface and bulk softness into one overall softness value include the Handle-O-Meter, the Kawabata Evaluation System and the Tissue Softness Analyzer (TSA). Over the past five years, the TSA, supplied by Emtec Electronic GmbH, has become fairly widely used within the industry for softness evaluation. It provides a hand feel (HF) index that is based on measurements of both surface and bulk softness, as well as tissue physical properties including caliper, basis weight and number of plies. The measure of surface softness is obtained by analyzing a frequency spectrum that is collected by spinning and lightly pressing a circular set of eight paddles against the tissue surface. The measure of bulk softness is then obtained by pressing the measurement head into the tissue surface to deform the sample with different defined forces, and thus allowing the calculation of the elastic, viscoelastic and plastic deformations. (reference and link to Wes’ paper here). 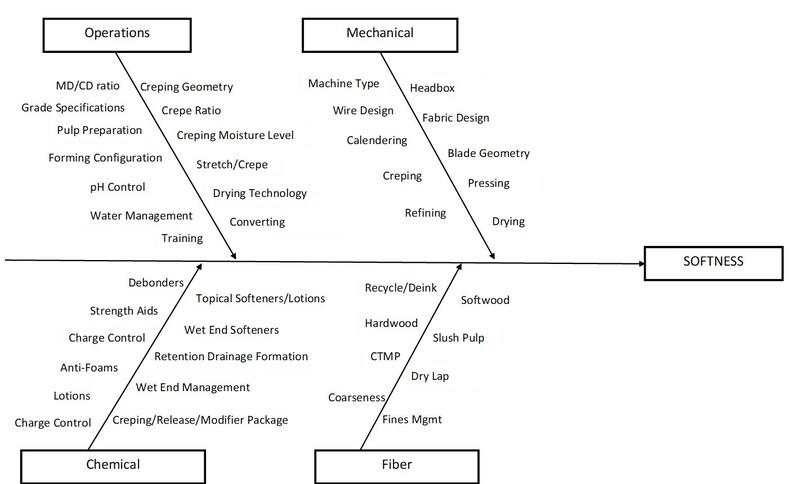 As illustrated in Figure 7 below, softness can be influenced by dozens of different variables in the tissue-making process. In this section we will describe some of them. Fiber Furnish – The choice of the fibers used, essentially virgin dry lap, virgin slush pulp or recycle, can have enormous impact on the surface feel and softness. For virgin pulps, the hardwood to softwood ratio is very important, considering the differences contributed by short hardwood fibers and the longer softwood fibers. For bathroom tissue or facial tissue, producers tend to use more hardwood and less softwood, to get both bulk softness and surface softness. On the other hand for paper towel grades, more softwood fibers are used to give strength and absorbency to the sheet. 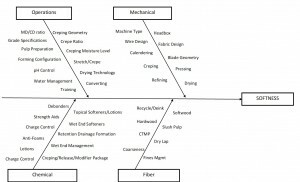 Although fiber morphology will be covered in greater detail in a different section of the Wiki-Tissue, it might be worth pointing out that a key characteristic of different woods and pulp grades is the number of fibers per gram. For example, Eucalyptus, which is widely used in making tissue grades, has around 20 million fibers per gram. A higher number of fibers per gram is desired for a more uniform surface feel. Southern mixed hardwood from the US has around 4 million fibers/g, and northern mixed hardwoods about 8 million. A typical softwood like Pine or Spruce has 2 million fibers/g. Stratification/Layering – Two-layer headboxes are fairly standard in tissue making these days, although three-layer headboxes have also been used. The strategy is to put the hardwood on the outside to get the hand feel. And softwood is placed on the inside for strength. Depending on how many plies are used in the finished product, producers can arrange the sheet so that the softest surface is placed on the outside, which is felt by the user. Formation – As for many other grades a paper, formation is extremely important for a low basis weight sheet like tissue, both from a strength standpoint and a softness standpoint. Formation is highly influenced by the choice of fibers/furnish composition, which in turn impacts the fibers per gram. Because of the inverse relation between strength and softness, you want to maximize the strength you can get from good formation of the sheet, in line with the “weakest-link” theory. Also, regarding softness, the more uniform or well-formed sheet you present to the doctor blade, the more uniform the creping will be and therefore the more uniform the softness will be. Therefore, formation plays a very critical role all through the process and into the finished product. Manufacturing process – While the conventional configuration or Crescent former is by far the most common type of tissue machine (as covered in Chapter 3), there are numerous technologies which create a much more highly structured sheet. Among these are the well-known TAD process, as well as newer variations such as NTTTM, ATMOSTM, e-TADTM, and f-TAD TM. In TAD, and for all highly-structured to sheets, the entire aim is to prevent densification so you improve the bulk softness. Pressing – In a similar manner, to prevent sheet densification, you want to minimize pressing as much as possible as well. To do this, most conventional machines today just have one suction pressure roll against the Yankee dryer, rather than two press nips. However, when you are trying to make a fairly dense sheet like a lower-quality Away-from-Home (AfH) tissue grade at a very high production rate, then you might want to have two presses rather than one. Shoe presses have also become very popular in the last decade or so because the high peak pressure is avoided since the pressing zone is wider. In the TAD process, you generally don’t do any wet pressing at all. Calendering – Some machines and producers also use calendering by means of a calender positioned after the creping and before the real. The aim is to try to get a more uniform surface feel. 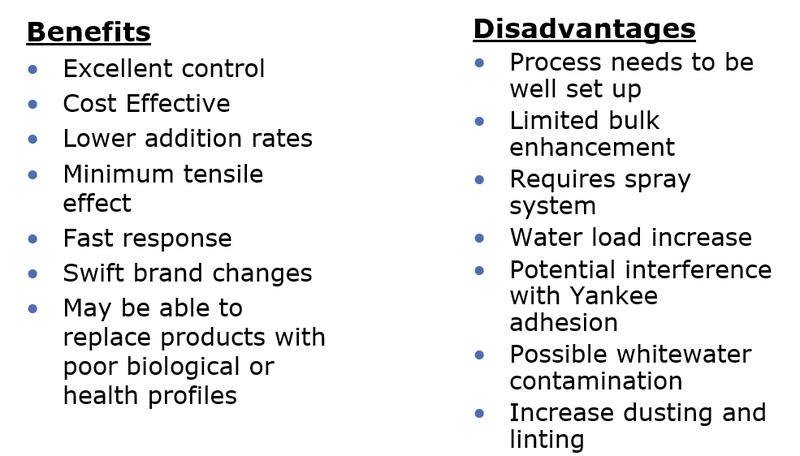 As indicated in Figure 7, besides factors such as the fibers used, the mechanical configuration of the paper machine and its components, and operational variables, another possible way to achieve the softness desired is by chemical means. Thus when improved softness is desired but it is not practical to make changes in the fiber types, machine configuration or machine operation, chemical softening of tissue is a good option. It is often a simple and easy solution to improve tissue quality, especially by enhancing bulk and surface softness. In addition, it is not highly capital intensive, other than piping, pumps and perhaps a spray application system. Debonders work by interfering with hydrogen bonding (H-bonds) between fibers (Figure 8). This means they increase the average fiber-to-fiber distance, and decrease the sheet density. The effects of debonders are illustrated in Figure 9. Softeners on the other hand work by enhancing the surface feel of the tissue sheet, without doing much to promote large-scale debonding. 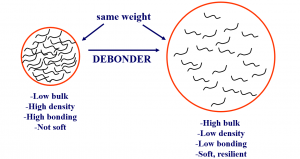 With a debonder you are trying to promote loss of tensile strength, whereas a softener is aiming to get surface softness without much debonding . Softeners are quite often added by spraying them onto the sheet as it is being carried by the felt prior to the Yankee. But sometimes these chemistries are used as part of the Yankee coating, where it is transferred onto the sheet. It should be noted that you can’t apply an aqueous-based softening product after you have creped the sheet, since adding any water in converting would cause you to lose most of the structure that you have just built into the sheet. Figure 8: A schematic representation of the mechanism of a cationic debonder. 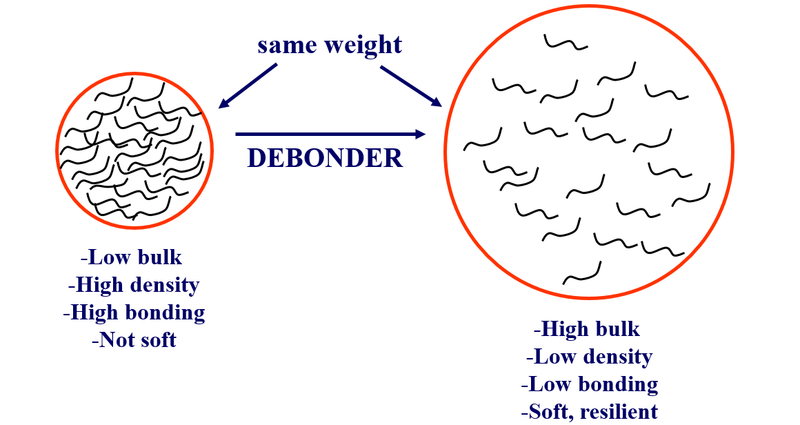 Figure 9: The effects which occur with the use of debonder. As shown in Figure 10, cationic softeners are characterized by relatively strong ionic bonding to the fibers through the positively charged hydrophilic head group. Amphoteric surfactants can also function in this manner, whereas nonionic surfactants can adsorb on fiber surfaces by weaker interactions such as Van der Waals forces and hydrophobic effects. All surfactants are characterized as having both hydrophilic and hydrophobic portions of the molecule. As also depicted in Figure 10, the hydrophobic portion of the softener orients away from the fiber surface and provides a lubricating effect to the touch. Figure 10: A micro and macro schematic of the mechanism of cationic softening, which gives a lubricating effect on the tissue surface. 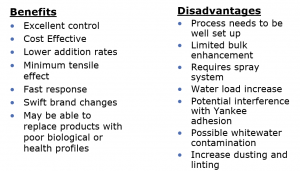 Application of the softener or debonder is usually done in one of three ways. It can be mixed with the stock in the wet end, or it can be sprayed directly on the sheet or on the Yankee, or it can be sprayed on the dry sheet in the converting process. Figure 11 shows a schematic of the possibilities. As with most activities in tissuemaking, there are trade-offs that need to be considered when deciding whether to add the chemicals in the wet end or to spray them on. A summary of the advantages and disadvantages of each method are presented in Figures 12 and 13. What a tissue maker decides to do will be very much based on his or her specific situation concerning operational and quality requirements. The addition of lotions at the converting line is gaining wider acceptance since these can be sprayed or printed onto the sheet. In this way several advantages are gained including eliminating any interferences with wet end additives or with the Yankee coating chemistry. This procedure also allows for a very flexible choice of ingredients, as well as making a wide range of add-on rates possible. Essentially you can print a lotion onto a sheet to give the softness that is required. Some lotions are also designed to transfer soothing and softening additives to the skin. Tissue softness, and ways to improve it, is a very complex subject. This initial overview is meant to give the reader an introduction to this area. With softness being such an important end use property of tissue, producers and their suppliers are continuously striving to provide improved strength-softness qualities by innovating with raw materials, machine design and operating conditions. As the Wiki-Tissue project develops, more information regarding the use of chemical softening for tissue paper products will be developed and presented. 1. Leporte L. E., Project 2817, Report 2, The Institute of Paper Chemistry, March 1970. 2. Gallay, W., “Textural Properties of Paper: Measurements and Fundamental Relationships,” in the Fundamental Properties of Paper Related to its Uses, Vol. 2, F. Bolam Ed., Transactions of the Symposium held at Cambridge, Sept. 1973. 3. Hollmark, H., “Mechanical Properties of Tissue,” in the Handbook of Physical and Mechanical Testing of Paper and Paperboard, Vol. 1, edited by R.E. Mark, pp. 497-521, 1983. 4. Civille, G. V. and Dus, C. A., “Development of Terminology to Describe the Hand Feel Properties of Paper and Fabrics”, Journal of Sensory Studies, 5, 19 (1990). 5. Marks, L. E., Sensory Processes, Academic Press, New York and London (1974). 6. Hollmark, H. and Ampulski, R. S., “Measurement of Tissue Paper Softness: A Literature Review,” NPPRJ 19 (3), p. 345 (2004). 7. Lamb, H.-J., “Determination of Softness of Tissue Products,” 3rd PTS Tissue Symposium, Munich (2003). 8. Hollmark, H., “An Apparatus for the Determination of Surface Softness of Tissue and Related Materials,” STFI Report E94/11, 1994. 9. Kuo, L. -S. and Cheng, Y. -L., “Effects of Creping Conditions on the Surface Softness of Tissue Paper: Application of the Sled Method”, Tappi Journal, 83 (12), 61 (2000).